Effects pedals, a.k.a. 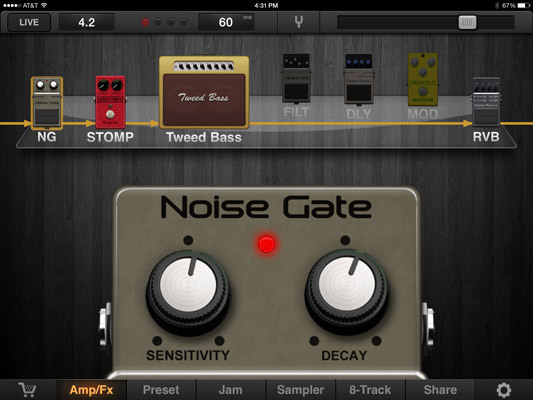 stompboxes, are a key part of most players’ iPad or iPhone setups, and modeling apps offer virtual versions aplenty of such pedals. 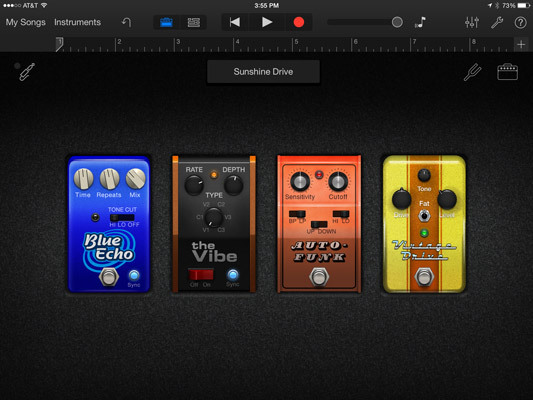 You usually get a virtual pedalboard with slots into which you can load several effects from an available collection. Although you can usually get distortion and crunchy sounds from an amp model by turning up its Gain or Preamp control, if you want to add more grit or to distort a clean amp, a distortion pedal or overdrive effect is your ticket. The difference between the two is that distortion is a more intense effect, not only distorting the sound but also adding a lot of sustain. Fuzz boxes are another type of distortion effect. Heavy distortion tends to be used more in metal and other rock styles. 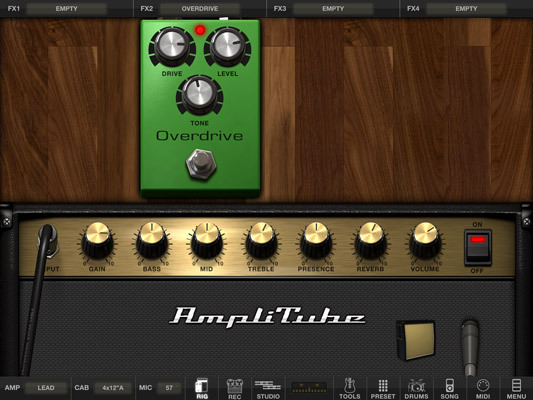 Overdrive is designed to break up the guitar sound as well, but in a more subtle way. It’s good for crunchy sounds with less mayhem than you’d get with distortion, but it too adds some sustain and plenty of warmth. In addition to the RAT, another oft-modeled pedal is the Ibanez Tube Screamer. Often referred to by the model number of its most iconic incarnation, the TS-9, it’s probably the most famous overdrive pedal of all time. Chorus: This effect gives your signal a lush, wider sound by combining it with a duplicate signal that’s slightly detuned and slightly delayed. If you’ve ever heard a 12-string guitar, which has many pairs of unison strings, the effect is somewhat similar. Flanger: Flanging was invented in the days of analog tape. It was achieved back then by playing two tapes with duplicate material in unison, with the engineer pressing on the edge (flange) of one of the reels to change speed. This effect adds a sort of rising and falling whooshy sound to your guitar or bass. Phase Shifter: A phase shifter also creates its effect by duplicating your original sound and modulating it. Its effect is similar to a flanger, but subtler. Filter effects pass your guitar signal through a filter of some sort, which cutsor boosts particular frequencies. These effects run the gamut from basic EQ to wild, synthlike effects. Wah pedals are also filter effects. 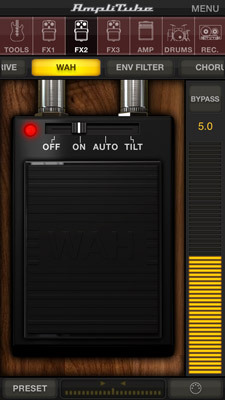 Guitar effects apps often feature wah pedals, and usually one is an auto-wah, which acts on your audio automatically based on the level of the input signal, without the need for an expression pedal. Of course, if you have a MIDI expression pedal, which sends continuous controller information, you can use it on “manual” wahs in the ­collection. You can also move the virtual wah pedal with your hand on your devices screen, although it’s hard to do that while you play! Auto-wahs, though convenient, don’t offer the level of control of manual ones. 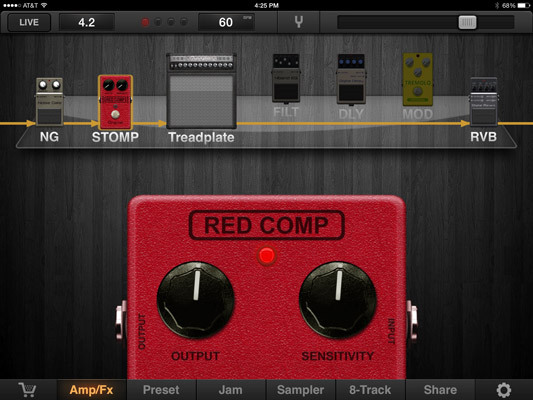 Compressor: Compressors even out the dynamics of your guitar or bass signal by squashing down the louder parts. Guitar or bass stompbox compressors typically have a sustain control or compression control for increasing the intensity of the compression effect, a Level control for adjusting the output, and an Attack control. Noise gate: These are not typically modeled from a classic pedal effect, but they are very important for keeping buzz from the app’s virtual amp from getting into the signal. Two other common effects types are reverb and delay. 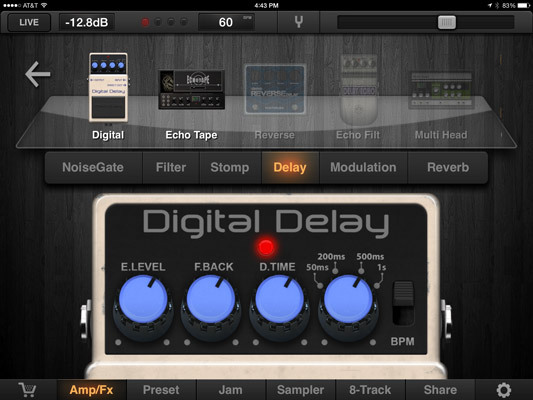 In a lot of guitar multi-effects apps, the reverb is an emulation of the amp’s own spring reverb. In some apps, that reverb is controlled by a single knob that’s a virtual version of the reverb knob on the emulated amp’s face. 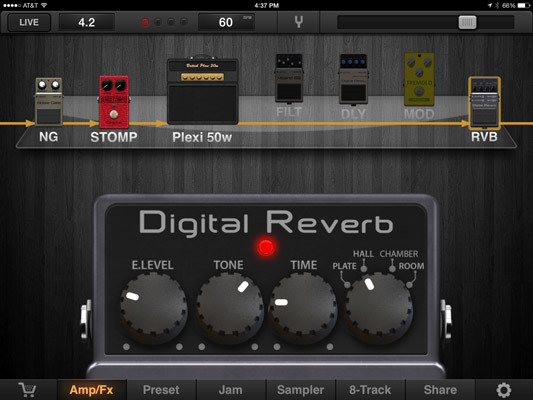 Many apps offer other ways to get reverb into your signal, often in the form of virtual reverb pedals. Emulations of digital reverb pedals can give you choices of emulations of different types of spaces such as halls, rooms, chambers and plates. Plate reverbs were artificial reverb units used in the pre-digital days, which were made from large metal plates and had a speaker and a microphone built into them. The audio to be reverberated was sent through the speaker, where it bounced around inside the plate and was picked up again by the microphone. Chamber refers to an echo chamber, which, despite having the word echo in it, was designed for creating reverb effects. It was typically a dedicated room with hard surfaces for the sound to bounce around in. Another important reverb parameter is decay time, (sometimes called room size). It determines how long it a note will reverberate. The larger the size of the virtual space, the longer it will take the sound to decay. Delay, which is also referred to as echo, not only has wet/dry controls, but also the very important Delay Time knob. Delay time is typically measured in milliseconds (1/1000 of a second). With the delay time set between 50 to120 ms, you get what’s essentially a doubling effect. From 120 to 175 ms, you get a “slapback” effect, which is a staple of rockabilly and country, and was the type of delay that was used on Elvis Presley’s vocals in his early career. Delays that are above about 250 ms are heard as distinct echoes. Another important setting on a delay is called feedback. It determines how many times the echo will repeat. Be careful not to set it too high, or you’ll create a feedback loop.